With graduation season quickly approaching I think its worth giving a shameless plug for the three books that I have written. It's worth mentioning that if you have a son, daughter, niece, nephew, friend or friend/co-worker who has a child who is graduating from high school/college/graduate school and you need graduation gift ideas - well, I've got three for you. When God Says Jump - the first book that I wrote about the concept of risk-taking and its importance in the life of a follower of Jesus. Redefining Life for Men - a bible study I wrote specifically for men in their late teens and twenties, dealing with the issue of what does it mean to be a young man of God. 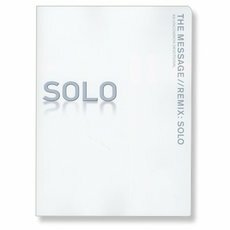 The Message Remix//Solo - a unique project that I wrote with two other authors that uses the ancient prayer practice of lectio divina and the text of the Message. These can be found at Amazon, Christian Book Distributors, Barnes and Noble, Borders and your local Christian bookstore. And if you live in the area, I'd be glad to sign those books for you, if you wish. I received a message yesterday from the sales director of NavPress that the project that I helped write - the Message: Remix // Solo - was the #1 devotional on Amazon yesterday. To be honest, I am humbled and surprised that the project is doing this well. My prayer is that it will be used by God's spirit to transform people through the ancient prayer practice of lectio divina. Cuando Dios Dice Que Saltes, Salta! 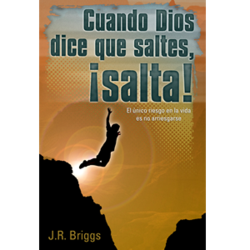 My first book project has been translated into Spanish and is now available for purchase online. Casa Bautista, based in Mexico City, bought the rights from my publisher and is distributing the book to most of the Central/South American Spanish speaking countries. I'm praying that God would use this translation to challenge people in the Spanish speaking world regarding risk and faith. We're in Michigan for Thanksgiving visiting Megan's parents. Today I spent a few hours in a Barnes and Noble just perusing, reading and relaxing - something that a self-proclaimed nerd like myself loves to do on a day off. During my perusing, I noticed a display table near the front of the store with a sign above it that read "Religion" so I wandered over to see what books the staff had laid out to display. And it shocked me a bit at first...and then made me smile. Next to the paperback NIV Study Bible, Donald Miller's Blue Like Jazz and Joel Osteen's newest book I recognized the starkly simple white cover of my third book project. Not sure why they would put such a book on the table next to so many well-known and better-selling books, but it was a fun little treat to see that. It's like overhearing someone at a restaurant say something nice about you to someone else when they have no idea that you are there. It's startling, but the gesture makes you smile. I know that my publisher publishes books both nationally and internationally, but it still strikes me funny when I see a book that I wrote on a shelf or a display table of a national bookstore chain in another state. 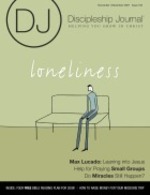 A while back, I wrote an article for Discipleship Journal (a quality Christian magazine published by NavPress). Their theme for their Christmas issue this year is loneliness so I wrote about the story of Hagar and her loneliness from Genesis. It's interesting to note that the slave girl Hagar is the only person in the Old Testament to give God a name. The name that she gives God Almighty? el ro'i - "the God who sees (me)"
Discipleship Journal just published the article in their most recent issue - the November/December 2007 issue. Last night I had the first chance to take a peek at it and they did a fabulous job with the layout (DJ always does a great job with their artwork and design). 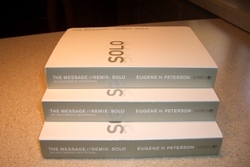 After waiting way too long for it to arrive, this past week I got my first look at an ink-and-paper copy of my third book project, a compilation project with two other great writers called The Message://Remix: Solo. When my Amazon shipment arrived I tore it open to find three copies of the book. The cover looks beautiful (so simple and stark, I love it) and I love the layout and design. I admit: I love these first glimpses of my book projects; a chance to touch and hold and skim the pages for the very first time. All three times its been euphoric. It's like getting to hold your child for the first time in the hospital or something. It makes it feel really real. It's satisfying. It's when it hits you: All this hard work has paid off, gone from a Word document on your computer to the shelves of your local Barnes & Noble. Here are a few shots I took while looking at them for the first time. Good news: I just heard from someone at the publisher who told me that they pre-sold more copies than what they printed so they couldn't even fulfill all their initial orders (which might be why there was a delay) which means its already on its second printing. It should be back in stock soon. Forgive the shameless plug here (I have done very few shameless plugs for my book projects in the past two years, even on my own blog, so I guess I can't feel too apologetic here) but if you haven't picked up a copy of it yet, you can get it here. If you missed the other two book projects I've written you can check it out here and here. Several have contacted me wondering why they can't get the Solo project yet. 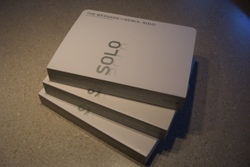 I just heard word from the publisher than the Message Remix://Solo won't be out for two more weeks - the new street date for the book release is September 15. I'm eager to see it, but we'll just have to wait a little while longer. My third writing project hits stores this week (August 30 to be exact). It's called The Message//Remix: Solo. After writing a book and Bible study for 20-something guys, I was asked to work on this unique devotional project. 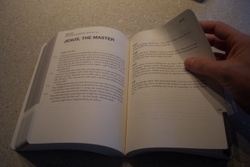 The Solo project is mixing the ancient prayer/Bible reading practice of lectio divina with The Message Bible. I'm one of the contributors to the project, along with spiritual director Jan Johnson and Katie Peckham. This project took a lot of creative energy and much more time than I imagined, but I am proud of it and I pray that people would connect with God through prayer, Scripture and quiet listening because of what I have written. Thank you to Megan for her patience and the space she allowed me to have on this project, Eugene Peterson for his blessing on the project and editor Laura Wright, who patiently worked with me in the midst of my insecurities and incomplete sentences to make it tighter. Thanks to Starbucks for good white chocolate mochas I sipped as I wrote, Panera Bread Company for free wifi and U2 for extra inspiration on the iPod. Look for it at your local bookstore this week or check it out here. 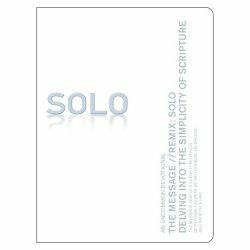 [UPDATE: A friend just informed me that at the moment, Solo is currently ranked #36 on Amazon's list of Christian devotionals]. I'm putting the finishing touches on a few sample chapters for two book proposals that I'll be submitting soon. I've been talking seriously with a great publisher about a two book deal and I need to get this off to the editors soon. I'm jazzed about the concepts, excited about the potential opportunity to work with this publishing house and even more excited to get back into the book writing rhythm. (2) what we can learn from the friends of Job of how not to help people who are grieving - impacting how we can best comfort and help friends and family members make sense of loss and grief. 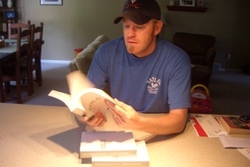 Several months ago I finished writing my portion of my third writing project with NavPress. While it won't be out until the end of August, I got my first look at the cover on Amazon.com a few days ago. This project is called The Message//Remix: Solo. : Delving Into the Simplicity of Scripture. I am one of three contributors to the project. The project is unique; it took my editor a while to convince me to agree to do it, but I'm glad I did it. It's a study that combines two unlikely resources: the ancient prayer & Bible reading practice of lectio divina and the text of the Message Bible. As an author, the first time you see the cover of your writing project your heart always beats hard and your first thought is 'Will I like it?' (Because, like it or not, people still do judge a book by its cover. And so do authors). And the truth is I love the cover. It's so stark and simple and striking. You can read more about the project and/or pre-order the book here.